Institute of Technology Carlow and Carlow College, St. Patrick’s sign historic collaborative agreement for joint higher education and research initiatives. The Presidents of Institute of Technology Carlow and Carlow College, St. Patrick’s are delighted to announce the formal signing of a Memorandum of Agreement (MoA) with the aim of strengthening their existing relationship. 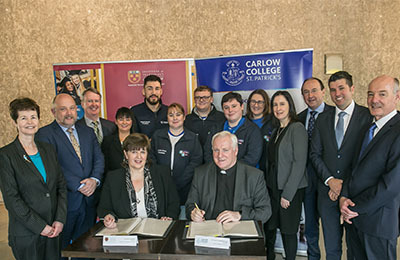 Carlow town benefits from having two higher education institutions and this agreement recognises and strengthens the ongoing partnership between the two institutions and their shared interests. The National Strategy for Higher Education encourages and supports collaboration between and across all higher education institutions and particularly those in geographic proximity. The MoA specifically recognises the synergy and opportunities in the applied and academic fields of the Arts, Humanities and Social Sciences and the significant potential to bring added value and benefit for learners.